Once again, a dinosaur purported to shed more light on dino-bird evolution has been unveiled from Mongolia—dubbed Mahakala omnogovae.1,2 The supposed importance of this latest find is in its small size: it apparently transfers the small size requirement for flight from the early birds to their dinosaurian ancestors. 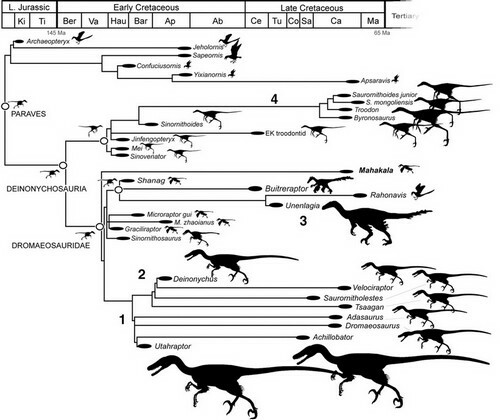 In reality, however, its small stature also reflects its small significance for dino-to-bird evolution. Frank Ippolito, American Museum of Natural History. Figure 1. Artist’s conception of Mahakala. These sorts of conceptions misrepresent the fossil evidence because there was no fossil evidence of feathers on Mahakala. The first thing that needs to be stated before anything else is that no feathers were found with this fossil. This of course doesn’t stop them postulating that they had them and rendering them as such (figure 1) because they require Mahakala to have them for dino-to-bird evolution to even get off the ground. This is the same problem that researchers ran into with Gigantoraptor. They assume it was feathered,3 then claim it as evidence that dinosaurs were feathered, without providing any independent evidence! 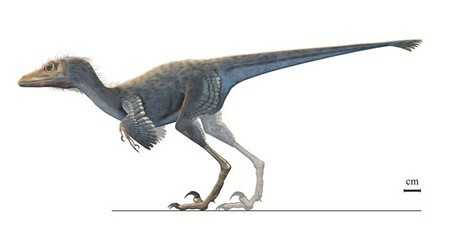 This doesn’t mean it didn’t have feathers, it simply means they currently have no fossil evidence to show that it did. Secondly, they speculate that Mahakala is an evolutionarily significant find that sheds light on the origins of dromaeosaurs (which advocates of dino-bird evolution believe are close dinosaurian cousins of birds), and, by extension, birds. However, the morphological and chronological sequences they construct to place Mahakala do not bode very well for its claimed significance. Mahakala is claimed to be a basal dromaeosaur largely because of its small size, but this requires evolutionists to postulate 60 million years of ‘evolutionary stasis’ (itself a contradiction in terms). However, other ‘relatives’ of Mahakala diversified to a far greater extent at a much earlier period (figure 2). They seek to justify this by claiming that small theropods like Mahakala are more unlikely to be preserved than their larger ‘relatives’.4 However, their evidence is equivocal, and they admit that at times it plainly contradicts their argument because in some of their ‘branches’, the smaller creatures predate the larger ones, showing that indeed the smaller can preserve earlier. Moreover, earlier birds such as Archaeopteryx were of a similar size to Mahakala, so their size can hardly be significant for the origin of avian flight because the small size already existed before dromaeosaurs apparently branched off from everything else. From Turner et al., ref. 1, p. 1380. Figure 2. 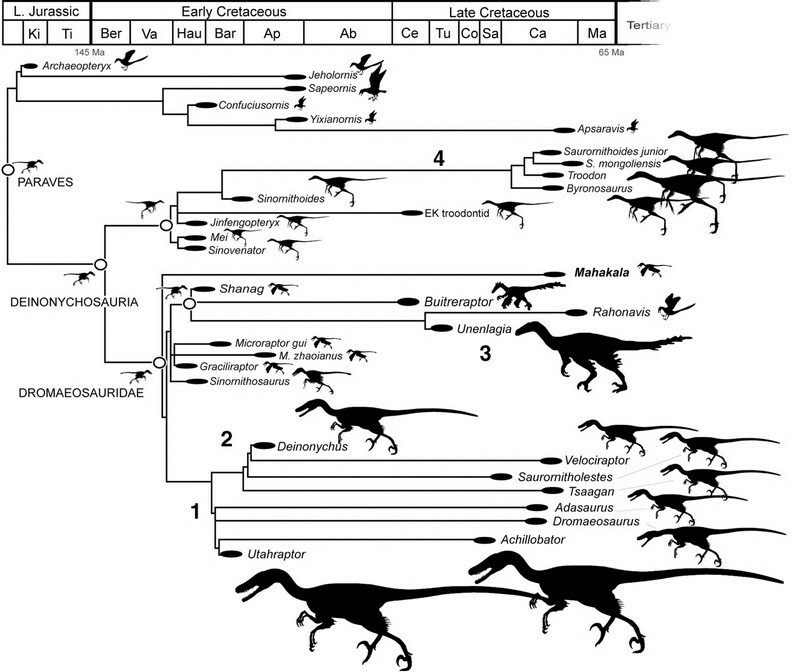 Cladogram, assumed to be an evolutionary ‘lineage’ of birds and their supposed closest dinosaurian ancestors. The silhouettes are to scale, and the left-facing silhouettes near open circles show reconstructed ancestral body sizes. Mahakala is needed to make the ‘ancestral’ size of dromaeosaurs match supposedly related lineages, but it came on the scene a little late. Click here for a larger view. This is perhaps more an example of the researchers trying to bolster support for the importance of their particular fossil rather than actual significance, especially when their own contrived geological dating context speaks against its significance. Therefore, in evolutionary terms, the grand importance of this find is readily disputed. Unfortunately, however, the widespread publicity given to the find, with its repeated references to ‘evolution’, gives an impression that this is yet more evidence of evolution, no doubt misleading many. However, to preserve the significance of their supposed ‘feathered dinosaur’ (though Mahakala had no feathers) they do what may seem like a nice bit of sleight-of-hand. They turn all these supposed ‘feathered dinosaurs into ‘ghost lineages’, which then makes Archaeopteryx younger than the ‘feathered dinosaurs’. However, ‘feathered dinos’ and other such fossils that are regularly paraded in the media reinforce the myth that evolution is a fact. Evolutionists also shuffle Archaeopteryx off to the sidelines of bird evolution by citing differences from modern birds, such as the presence of teeth. They have also claimed that chickens found with mutations that produce teeth-like structures in their beaks prove their reptilian ancestry.7 However, one cannot have one’s cake and eat it too. The embryo shows that at least some modern birds have the genetic information for teeth, but do not develop them through a mutational loss of information in perhaps a tooth development gene. Therefore, the difference between modern birds and Archaeopteryx is not as great as evolutionists would like. Not only that, there is no guarantee that modern bird morphological diversity represents the original condition between different bird kinds, which may have been wider since some are likely to have gone extinct post-Flood. Therefore, from a biblical point of view there is no need to bow to evolutionary limits on significant bird morphology. Archaeopteryx however does possess unique structures that set it apart from other birds, of which some may bear some similarity to dinosaurs. However, all the traits appear fully formed in all Archaeopteryx specimens. Therefore, it does not demonstrate evolutionary change, but only presents a unique combination of fully formed traits (a mosaic or chimaera). Despite evolutionists’ protestations, Archaeopteryx presents evolutionists with the problem of having to deal with a recognisable bird (with feathers and powered flight to boot) that (by their reckoning) is 70 million years older than this latest find. The more fossils that get unearthed, the more complicated the evolutionary storytelling gets to fit all the data in. Mahakala adds to the confusion. However, ‘feathered dinos’ and other such fossils that are regularly paraded in the media reinforce the myth that evolution is a fact. They are unusual and capture people’s imaginations, and because they’re always presented in an evolutionary framework, people assume there is no plausible explanation for these creatures based on the Bible. However, feathered dinosaurs per se do not contradict the Bible, as they could be original creations of God that went extinct after the Flood. Moreover, several evolutionists dispute that feathered so-called dinosaurs (that is, the ones that actually have feathers) are actually dinosaurs. Rather, they say they are flightless birds, meaning they would be extinct birds instead of dinosaurs from a biblical view. And once again, Mahakala had no feathers! Mahakala is a little fossil of little significance that evolutionists have blown up into a storm—but in reality the storm is so little that it fits into a teacup. Bryner, J., Tiny dino was ready to fly, 6 September 2007. Return to Text. Turner, A.H., Pol, D., Clarke, J.A., Erickson, G.M. and Norell M.A., A basal dromaeosaurid and size evolution preceding avian flight, Science 317:1378–1381, 7 September 2007. Return to Text. They do this on the basis of their reconstructed phylogeny (evolutionary history of organisms). However, this is a strictly evolutionary interpretation of the evidence, which by definition does not allow a non-evolutionary explanation of the similarities and differences in morphology observed in different fossils and extant organisms. It is important to note that evolutionists do not exclude intelligent design (especially biblical creation) on the basis of plausibility (i.e. ability to explain the evidence as it stands), but on the basis of possibility. Intelligent design, for a priori philosophical reasons, is ruled historically impossible by evolutionists. In the case of theistic evolution, they may not class God as impossible, but rather agree with Laplace in finding ‘the God hypothesis unnecessary’ for explaining natural origins and history, which is the basic premise of methodological naturalism. In practice it gives the same results as metaphysical naturalism—a closed continuum of naturalistic cause and effect in which God doesn’t have any input. Return to Text. Turner et al., ref. 2, Supplementary information, pp. 21–23. Return to Text. For more information on this systemic problem of dino-bird evolution, see Woodmorappe, J., Bird evolution: discontinuities and reversals, Journal of Creation 17(1):88–94, 2003. Return to Text. 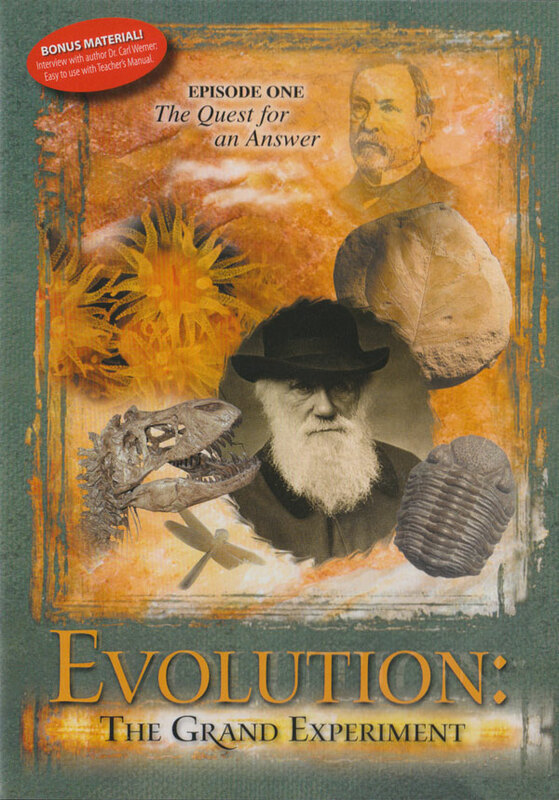 Dodson, P., Response by Peter Dodson, American Paleontologist 9(4):13–14, 2001, cited in, Woodmorappe, ref. 5. Return to Text. See Wieland, C., Chickens with teeth, 25 July 2006. Return to Text.